There’s a new attraction at Cardiff Castle, a dragon. 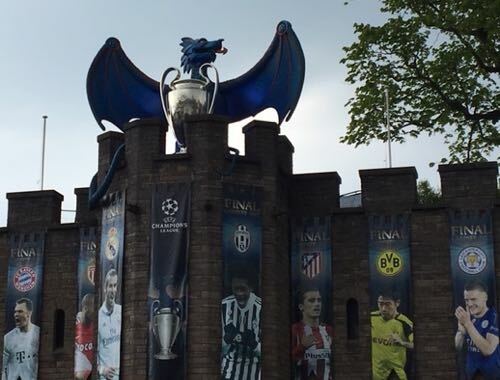 It flew in last week to protect the Champions’ League Trophy securely locked away in a turret on the ramparts. The dragon and replica trophy were created by Wild Creations, who designed the ball in the wall installation for the Rugby World Cup in 2015. It’s all part of the build up for the Champions League final in the national stadium of Wales on 3 June between Real Madrid and Juventus, and where it’s hoped Gareth Bale will be playing infront of his home crowd.